Solar lights are really easy to install. Just push them into the ground. You have to make sure the solar panel gets good sun. The more sun, the longer and brighter the light will glow at night. If you want to move it, just pull it up and push it in somewhere else. Disadvantage: Even the best solar lights are not very bright. They are ornamental, but are unlikely to be bright enough for safety or security. 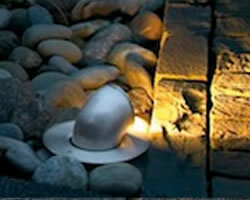 Low voltage landscape lighting uses is safe to work with and easy to install. You can move it pretty easily. Most low voltage landscape lighting uses 12 volts. Some uses 24 volts. Just add up the wattage of the lights you are putting in and order a transformer that exceeds that number. Buy enough wire to connect all of the lights to the transformer. The transformer is plugged into an outlet. 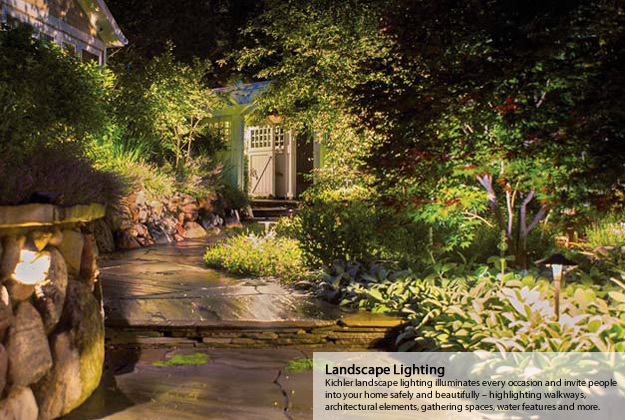 With new energy efficient options, low voltage landscape lighting is less expensive than ever. Disadvantage: There may be voltage drop if you travel too far from the transformer. That means the distant lights will be a little less bright. Line Voltage Landscape Lighting uses 120 volts, the same voltage as the wiring in your home. It may require permits, inspections and a qualified electrician to install. Once it is installed, it is as permanent as the wiring in your home. You can move it, but not easily. The wire is hardwired from your breaker box. Buried conduit protects the wires from the house to each light. Disadvantage: This is not an easy do-it-yourself project. Landscape Lighting Kits are reasonably priced and easy to install. Kits are available with spot lights, flood lights or both. Versatile LED Solutions Kichler LED accent lighting helps showcase landscape features with true, clear, warm, white light without intruding on the scene. Spot lights, flood lights and wall wash lights coordinate with pathlights, well lights, deck lights, steplights and brick lights for a complete landscape lighting design. High quality, high style aluminum path lights, deck lights, wall lights and sign lights. LED Finished in bronze. 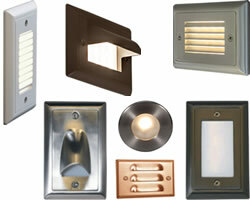 A variety of inground and well lights and kits from Eurofase, SLV Lighting, Kichler, Dabmar, Hinkley and Hadco Lighting. Light sources are LED, MR16, GX53/GX53, PAR20 or PAR30. 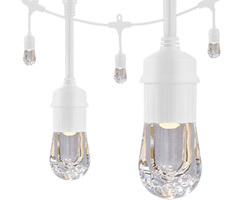 Attach to house, tree or outbuildings to light landscaping or provide security lighting. Using 12V downlights mounted in tree allows you to create attractive leaf and organic patterns on a walkways or the effect of moonlight in an otherwise shaded area of your property. With 12V Landscape downlights, you can accents your outdoor designs and provide addition lighting around your home. Submersible and decorative lighting for a pond or water feature. Perfect for path, walkway, driveway and entrance area lighting. Bollards are an excellent durable choice for commercial or residential lighting. SLV Rusty Bollards recreates harbor bollards. They are appropriate in a variety of architectural settings. They are made of cast FeCSi-steel and are extremely weather proof. Composite and Stainless Steel transformers, automatic timers and photocells, stakes, stems, lenses and louvers for - Nearly 100 years ago, Hinkley lighting was a small family outdoor lantern company. Now they are a a global brand bringing you the best in style, quality and value. Staying at the forefront of technology, Hinkley continues to utilize the best engineering expertise to offer a wide variety of long-lasting landscape lighting. Light on all walls of the home serves to minimize hiding places for unwelcome visitors. An ideal place to apply uplighting... shining skyward toward an area of architectural interest. Lighting the wall behind this tree accentuates its interesting shape and branch structure. This technique allows the designer to paint walls with non-light, generating added dimensions by repeating forms in shadow. The textured beauty of stone masonry becomes a striking feature when grazed with light. The repeated symmetry of this walkway lighting guides visitors while accenting the line of the path in the design, all with minimum glare.